Christchurch’s i-SITE Visitor Centre is moving to the Arts Centre’s Boys’ High building in spring, with surrounding spaces to be devoted to a range of specialty retailers. Owned and operated by Christchurch and Canterbury Tourism, the i-SITE currently attracts 250,000 visitors each year in its temporary location in the Botanic Gardens on Rolleston Avenue. The new 170 sqm i-SITE space at the Arts Centre is three times the size of the current i-SITE and will also be home to the Department of Conservation (DOC). Christchurch and Canterbury Tourism Chief Executive Vic Allen says the i-SITE is the first port of call for many visitors to Christchurch and the South Island, and is expected to attract over 280,000 visitors in the 2016-17 season. “Our dynamic new i-SITE promises to give both domestic and international visitors a complete visitor experience, and we are delighted to be working with DOC to offer the combined expertise of the i-SITE and DOC teams in one location,” he says. Christchurch and Canterbury Tourism has worked with Ngāi Tūāhuriri’s Matapopore Charitable Trust to integrate striking cultural elements in to the design, including a narrative journey depicted in art and signage throughout the centre. Arts Centre Chief Executive André Lovatt says the i-SITE is a natural fit for Worcester Boulevard given its proximity to numerous tourist destinations, including Canterbury Museum, Christchurch Art Gallery and the Botanic Gardens. Boys’ High will open in stages, with the i-SITE and other ground floor businesses opening first, followed by the spaces on the first floor and mezzanine level. The Arts Centre is currently seeking proposals for all other available spaces within the heritage-listed, two storey Boys’ High building. A café operator is being sought, along with creative industries that have a specialty retail focus, such as fashion, locally produced products, food and galleries. Built in 1881, Boys’ High is constructed in the Gothic Revival style and is one of 23 heritage buildings on the Arts Centre site. Facing onto Worcester Boulevard and Market Square, the iconic building’s exterior looks the same as it did pre-earthquakes but, once inside, a lot of its new strengthening is visible. Most noticeable are horizontal steel frames at ceiling height, although plenty of other strengthening techniques have been cleverly hidden beneath heritage features. The restoration has uncovered many historic treasures that were hidden over the years, including a stained glass window that overlooks the foyer’s grand staircase. Since 1978, the Arts Centre has been held in trust to benefit the people of Canterbury as a place where creative industries including arts, culture and education are fostered, promoted and celebrated. 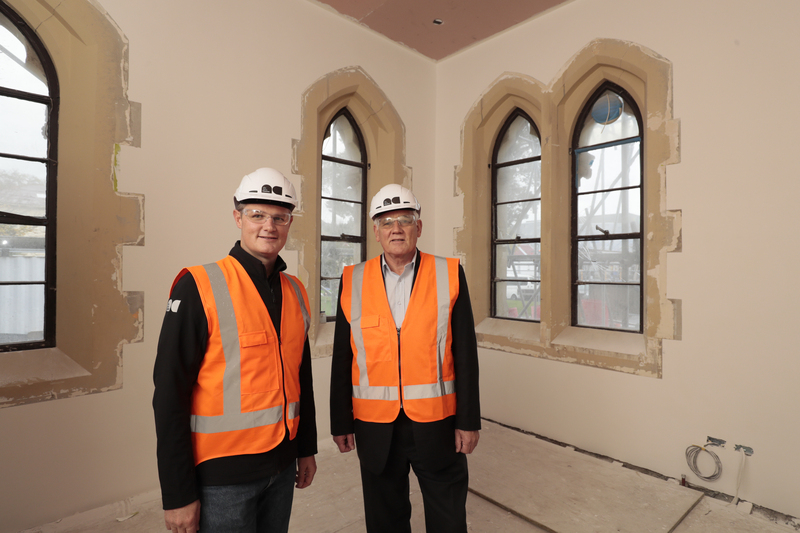 Its buildings suffered extensive damage in the 2010–2011 Canterbury earthquakes and an extensive $290 million restoration programme is underway, due for completion in 2019. Leasing proposals for Boys’ High will be received until 1July, after which they will be evaluated and a recommendation put forward to the Arts Centre Trust Board for approval. I-SITE is New Zealand's official visitor information network with over 80 I-SITEs nationwide. They provide free information, maps, and a booking service for accommodation, activities and transport by multi-lingual, local and highly experienced staff.